We are the leading manufacturer of Gas Sampling Bomb. 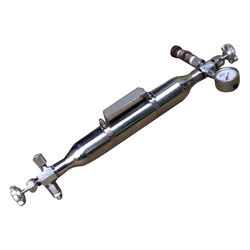 The company manufactures Gas Sampling Bomb, which is used to carry plant gases from site to the laboratory. To collect the sample of Liquefied Petroleum Gases such as Propane, butane Ethylene and similar materials. These samples are completely leak-proof and available in specific sizes. The wall of the sampler is specifically designed so that it can withstand high pressure. These samplers are highly reliable and provide years of trouble-free service.